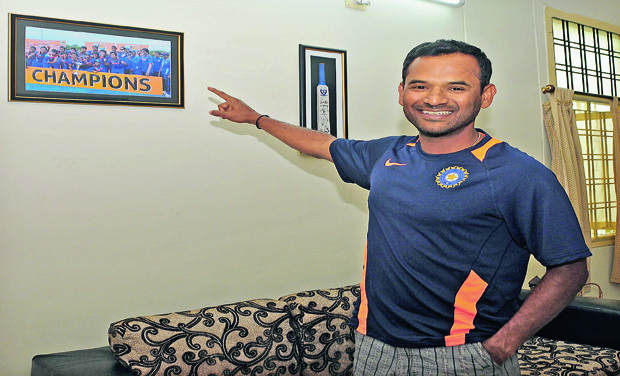 Hyderabad: Life’s been a steady flight for former left-arm spinner R. Sridhar. From his Ranji Trophy days that began in the late 1980s to being named the fielding coach of the Indian team on Tuesday, the hard-working Hyderabadi has been on the ball, and climbed the cricketing ladder ceaseless. He’s inexplicably thrilled about the big assignment but knows that the tough job has only just begun. Contractual obligations prevent Sridhar from speaking to the media now, though. He is currently in Chennai as head coach of the Andhra senior team participating in the ongoing Buchi Babu tournament. Having been a coach at the National Cricket Academy frequented by cricketers, Sridhar enjoys a good rapport with all the players. His association with newly-appointed assistant coaches Sanjay Bangar and Bharathi Arun is also well known he has worked with them on the coaching units of Kings XI Punjab and India U-19 sides respectively. Sridhar has a good track record as coach at the India U-19 level he was instrumental in preparing and encouraging his charges to play to their strengths, which translated well for the team. The Indian colts won the World Cup in 2012 and followed it with title triumphs in the Asia Cups of 2012, 2013 and 2014. The 44-year-old adopts an uncomplicated approach to coaching. “The key is not to impose yourself on the player. More than knowing his game, you’ve got to understand and connect with the person first. Once you do that, coaching becomes very easy you give the player options and see what suits him best, for each individual is different. It’s like handwriting. No two people can write alike, each has got his own flair. You have to nurture that,” Sridhar had reasoned in an earlier interview to this newspaper. Those words come from having extensively coached at various levels. After playing 35 first class matches for Hyderabad and taking 91 wickets, Sridhar turned to coaching in 2002. After three years of working at the grassroot, he started the process of his accreditation as a certified coach in 2004 and completed the three-level course in 2007. By the time he was incorporated into the NCA, Sridhar had already put in four years of junior cricket three years as head coach of the Hyderabad U-19 side and one year in charge of the U-16 squad. His first big break came when the Indian team turned up at the NCA for the 2011 World Cup preparatory camp. The same year, he was appointed fielding coach of the India U-19 side, and has been making persistent progress since.